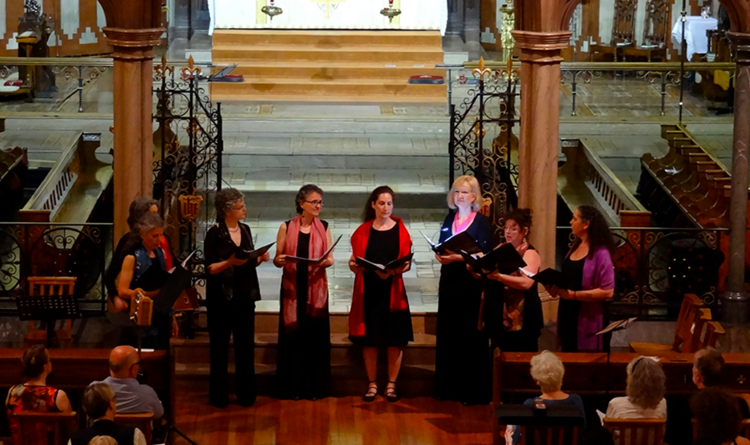 Ensemble Scholastica performing in Montreal’s Church of St. John the Evangelist in May 2015. 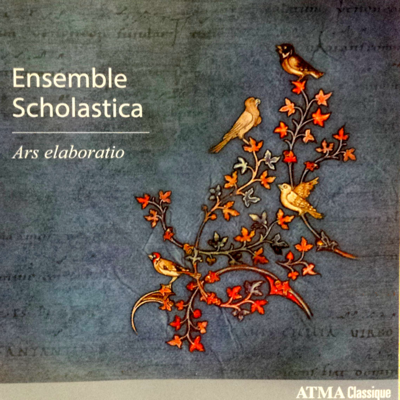 CD REVIEW — Ensemble Scholastica, a female vocal group based in Montreal, was founded in the fall of 2008. This album, their debut recording, therefore is certainly long-awaited. The ensemble focuses on plainchant and medieval polyphony, making use of original manuscript sources to generate their interpretations. Their past concerts have been organized thematically for particular liturgical seasons or by a particular composer; this album, however, is rather different. While the original chants were selected to pay homage to the group’s favorite saints (Scholastica, Cecelia, Catherine of Alexandria, and St. John the Baptist), the approach taken by the ensemble is not a simple question of whether to sing in equal durations or a bit more fluidly. Rather, it seeks to explore a different approach to the idea of “authenticity” by participating in the medieval practice of elaboratio. 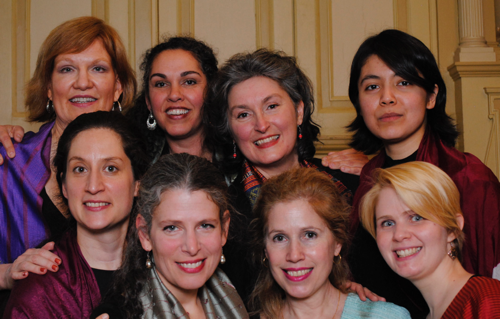 In her liner notes, musical director Rebecca Bain states that the possibilities for such elaboration included the insertion of musical or textual tropes, the addition of composed passages of two-, three-, or four-voice polyphony, improvisation against a plainchant tenor, and so forth. On this album, the ensemble uses all of these techniques and more. In her description of each of the thirteen selections on the recording, Bain specifies not only the original purpose of the piece or genre but also what kind of elaboration the ensemble has chosen for it and why. On pieces such as “Sancti baptiste,” the elaborator (here Catherine Herrmann) has added an organal voice to the early 12th-century monophonic setting of a Notker Balbulus sequence. On other pieces, the elaborator has added not a voice but a text: “Quinque prudentes virgines” includes a textual trope taken from the Speculum Virginum, a 12th-century text discussing female monastic life, while “Dilexisti iustitiam” adds textual tropes from poems dedicated to St. Catherine of Alexandria in the Las Huelgas Codex. Two antiphons have had new verses composed for them: the first selection, “Celsa secreta in columbe specie,” and “Dum aurora finem daret.” Bain used a melisma from an Alleluia for the feast of St. John the Baptist to create a brand new four-voice motet, borrowing texts for the top three voices from an anonymous English poem. And in several pieces, the elaborations are not vocal but instrumental; the ensemble includes dances and accompaniment performed on organetto, fiddle, psaltery, and symphonia. Even from the brief descriptions given to each piece, the amount of careful thought and planning that the ensemble put into each selection and into their approach to elaboration is obvious. It seems clear they envision this album speaking to knowledgeable consumers, whether performers, scholars, or both. Given that kind of audience, I wonder whether it might not have been more prudent, and certainly think it would have been more useful, for the ensemble to have gone into greater detail in their liner notes about the “medieval rules of polyphony” and of elaboration that they are stating they have worked to follow. An extra page of detail on that front, or even including the “original” alongside the elaborated, would not have gone amiss. The overall recording, from a listener’s standpoint, is nicely varied and well performed; the ensemble sings with a tasteful sense of unity and phrasing, and the perfect intervals resonate well in their acoustic space. I, for one, will be quite interested to see whether they continue to pursue elaboratio.